Located on the Texas Lakes Trail, 40 miles north of Dallas, Pilot Point is in the Heart of Horse Country, USA" and serves as a gateway to beautiful Lake Ray Roberts. It is a convenient getaway from the large city and provides and appealing trip through gently rolling hills into the Cross Timbers woodland. With a "special small-town feeling, Pilot Point is fast becoming "the place to be. Pilot Point Town Square was the location of the famous bank robbery scene in the 1968 movie. 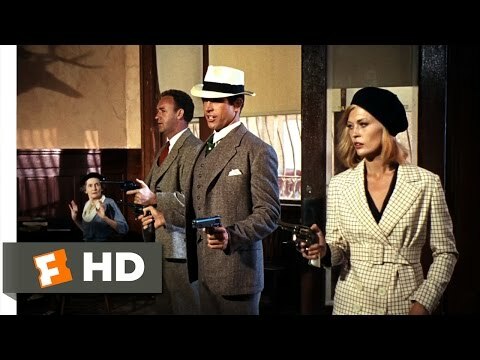 After a series of amateur heists, Clyde Barrow (Warren Beatty) and Bonnie Parker (Faye Dunaway) lead their first bank robbery as the Barrow Gang alongside a gas station attendant (Michael J. Pollard), Clyde's older brother Buck (Gene Hackman) and his wife, Blanche (Estelle Parsons). View an installment of The Texas Experience about the history and legacy of Bonnie Parker and Clyde Barrow, plus a home video capturing the filming of Bonnie and Clyde in Venus, Texas.